It’s been a full month since we released Hyper Holomayhem 37. With the holidays and university finals, we found little to no time to actually give our experience with Ludum Dare 37 the proper conclusion it deserved. But alas, some free time to be able to write and share with you the highs and lows of the development process of our second time on the rodeo! Hyper Holomayhem 37 is a side-scroller platformer shooter where, as a jetpacker trainee, you must stay for as long as possible in the Hyperdeck, a room that’s constantly changing layouts as you power it up with gears. Gameplay is based around collecting the gears spread throughout the level which you must bring back to the room’s core under a time limit. Enemies chase you around, and you will have break the blocks in order to get to some gears you wish to collect. Once the time is over, your training is complete. Our development team was composed of three game developers, each of us with a different area of expertise. JorgeGameDev returned again as the gameplay programmer and The ‘Moski once again fulfilled his role as the game’s artist, exactly as it had previously been the case with our Ludum Dare 36 game, Colossorama. However, this time around we also had the opportunity of having ZakBlystone as the game’s audio composer (which you can read more about below). Keeping with the pace from last time, we decided to stick with the usual tools for Hyper Holomayhem 37’s Development. 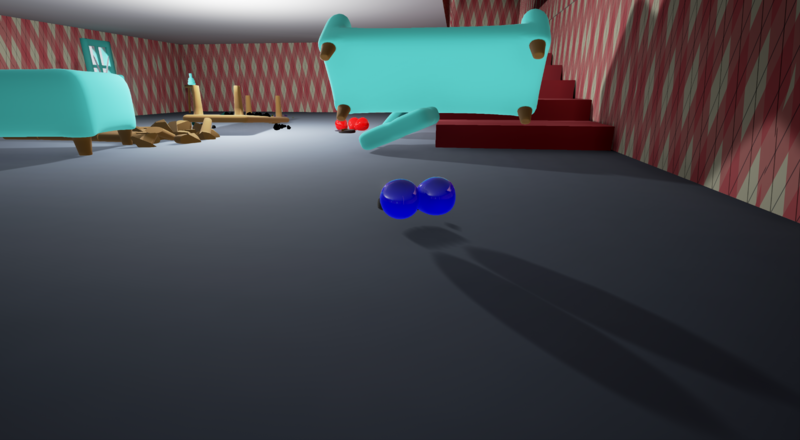 The game’s uses Unity as it’s game engine with gameplay programmed in C#. Krita was yet again used for producing the game’s art and Zak used FL-Studio for making everything from the Music to Sound Effects. After the jam’s theme (One Room) was announced, there were several ideas that were placed on the table as potential concepts that we could develop during the event. From all of those ideas, we decided to pick the concept of having an holographic room constantly changing layouts, now deemed in game as the Hyperdeck. 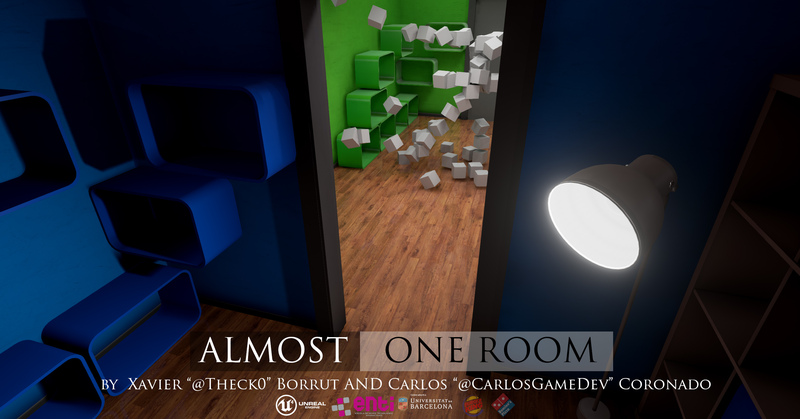 Other ideas and concepts included impossible room puzzles and even an Fingered-esque game about room decoration. The Hyperdeck idea was picked as the chosen idea not only due to the time limit we had to develop the game, but also to allow the game to have extra replayability value which is greatly enhanced in this concept thanks to the ever changing room layouts. 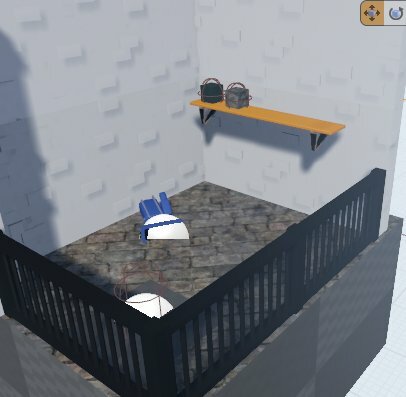 As progress on the game continued during the following days, we decided that we would focus on the game’s airborne platforming, as well as environmental destruction the player could make by destroying the blocks that made up the room’s layouts. These elements were then further expanded on with enemies, extra traps and even power-ups, all of them placed on the rooms at random, which also helped strengthen the game’s loop, even if several ideas had to be left on paper due to time constraints. One of the aspects that Hyper Holomayhem 37 was mostly praised on was the game’s overall polish. Although we had to make some cuts when it came to the gameplay, we made sure that game still felt complete and solid, as well as progressively let friends playtest the game in order to assure that no issue went unnoticed. One of the reasons why we favor polishing overall is to allow each player to feel like they’re interacting with a vertical slice of a potential game. This allows them to always know what to expect in case they come back, either on their own or due to an update. Once the game’s development was put up to speed, task division and scheduling was efficiently put into the place. We paced what needed to be done as we went through the days, and based on what content we knew we would be able to have in the game by the deadline. Same as last time, this allowed the submission hour to be fully dedicated to that for that alone, and based on requests from last time, we also provided a WebGL version right from the beginning. One of the things that we felt could have been better explored in Colossorama was the game’s audio. Last time, we were only able to find someone that could give us a hand on composing original tracks a few weeks after the game’s release and update. by that time, the great majority of potential players and Ludum Dare participants had already played the game. However, with Hyper Holomayhem 37 we were able to find someone who was eager to give us a hand with the audio composing, Zak. Having someone doing and composing audio on the team helped us give the game a set of unique sounds and a great music track to boot, making the game more unique, and distinctive when it came to audio. As mentioned above, several ideas were outlined right after the theme was announced. The final concept for Hyper Holomayhem 37 was only decided a few hours after the theme announced, which slightly delayed works. Nonetheless, even after the final idea was picked, there was a period of uncertainty regarding what exactly made our concept unique and what exactly would be the game’s core loop. At the time this loop was only the player going around collecting the gears and bringing them back to the core. This eventually lead to multiple, overthought discussions about implementing features like puzzles, etc. 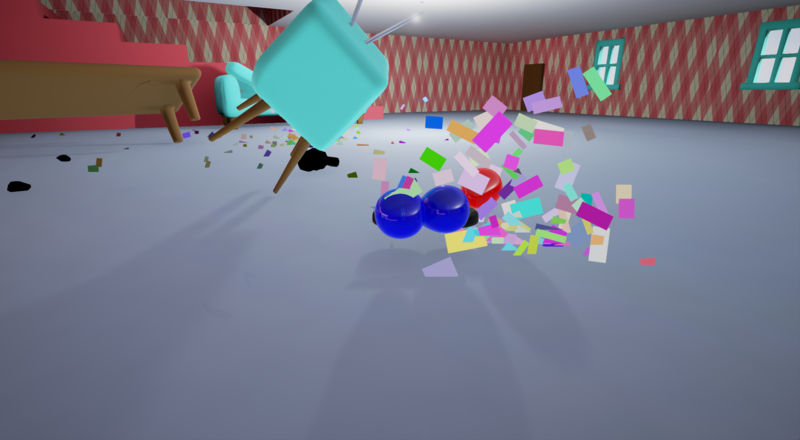 This uncertainty caused some delays, however, we then realized that the base loop we already had just needed to be spiced up, as collecting gears and destroying the room’s blocks was already engaging by itself, and playtesting helped confirm this fact. We then proceeded to add extra content to further solidify this game loop. Despite having settled with our game loop, there was still a lot of content that had to be cut due to the time constraints, some of which caused by the delays of the concept’s uncertainty. Although each of us knew which tasks needed to be taken care off, and what schedule to follow, we believe we could have better explored the game’s concept, as well as added a lot more content into the game. One example of a game’s concept that was not fully explored, and caused us to have a not-so-good score when it came to the theme, was how the Hyperdeck represented a single room. Some of this content that was unable to be included in the game included more types of enemies, power-ups and even completely changing the room’s aesthetic as the player completed layouts. We still hope to get back to these ideas in a future update. Even if the game’s development was filled with mixed feelings, we’re still happy and glad of the final results, dazzled by how well the game scored, getting a 51st place in Jam Overall. If an idea you have the beginning of jam already seems like it’s going to be complicated to develop, it’s probably better to go for a simpler idea, unless you really want to challenge yourself to execute a complicated one. Schedule your tasks, even if in an informal way. Make sure that every team member has a list of what’s needs to be done, especially if your team members are on different time zones. It’s always for the best to make assets that might end up not being used than not having assets for the time they are needed. Having an audio composer on board can really greatly improve your game and increase its atmosphere and value with unique sounds and music. Don’t overthink your game’s mechanics. Sometimes a few basic and quickly learn-able mechanics are enough to create an engaging game loop and diverse content. Always remember to build your game content, visuals and feel around your game mechanics. Form follows function. Do playtesting often, even if it’s just limited to friends, in order to collect some low-level feedback on what to improve. Ideally, playtest with non-familiar people, as they provide the best and more honest feedback. Focus on exposing your game after you finish it. One extra aspect we feel we could have done better was on spreading word about the game, which we didn’t do as much as we did with Colossorama. Feedback is the greatest thing a developer can get, and we’re glad that we’ve been able to constantly receive it. Hyper Holomayhem 37 was yet another great game we enjoyed developing, even given the hiccups, and we’re full of ideas on how to improve it, as well as for brand new projects we hope to do soon! Thanks a lot for reading! As always, even if post mortems are mostly for self-reflection, we have the optimism that those who read these always learn something from them. We’re really glad of our results and the feedback we’ve collected during Ludum Dare, and it’s all thanks to you, the wonderful jammer community. Our hands are completely full with assignments, commissions and other projects we must get done under a tight time frame, but we hope we are able to come back with some new stuff to show soon, as well as give Hyper Holomayhem a brand new coat of paint and bring it to the same level of content as Colossorama. It’s probably going to take a while, but it’s something we want to do as soon as we can! If you wish to keep up with what we’ve been doing, you can follow us at @JorgeGameDev and @The_Moski as well as @Zakblystone, which was a honor having as a guest to help compose the game’s audio. Thanks a lot! Until next time! And don’t forget to try out Hyper Holomayhem 37 if you still haven’t given it a go already! BreakAround PostMortem/Last Chance To Play+Rate Plus More!! It’s a bit extremely last minute seeing as there’s only a few hours left until judging ends but I’ve just uploaded the post-mortem for my LD37 entry BreakAround which you can view by heading down to my blog. In other news, I will be doing a livestream on my Twitch channel at around 9/10pm-ish GMT where I will be (yup, you guessed it) playing and rating some of your Ludum Dare entries. If you would like me to play/rate your game during the stream, you can do so either by filling in my small Google Form or leaving a comment when you play/rate my game so I can check it out (or alternatively just leave a comment here) otherwise when the stream does go live, feel free to send your games in the chat. First LD. Jam: not themed game, not solo. Realistic hacker simulator. Before LD: static HTML/CSS/JS sketch for login screen and desktop. Private Github repo. Day 1: terminal prototype, simple “internet” and system pages. Player which uses YouTube API. Day 2: set up LAMP stack in a VM and worked on backend systems – translation, search, networking and URL handling. Made IRC with button mashing and delayed messages. Friend helped with dialogs. Day 3: added ssh, integrated dialogs into IRC, created first two tasks and in-game blog with hints. Polished that a little: playlists, translation, icons, renaming, etc. Created an entry. And a link for you to play it yourself. If you do, please leave some feedback! I’ve got the idea for my first LD game a little bit before theme was announced. That’s why I’ve decided to take part in Jam and not to think about the theme. My game is a web-based hacker simulator game with realistic terminal commands. Well, as I’ve decided to submit a Jam entry, I wasn’t really restricted with “only in 48 hours” and “do everything alone” rules, so I made a small sketch. It was static HTML page with some CSS and JS for login screen and a desktop page with some icons. I’ve also asked some of my friends whether hey want to help me, and as they told me that they would, I’ve created a private Github repo for us to use. On the first day I had some university lessons to attend to. Lucky for me, it was a lecture about something I already knew, so I could code instead. That’s how console prototype was created: there was no layouts, just JS code, which I’ve been executing through Firefox Developer’s Console. That’s not a real shell, of course, but it could parse the input string into arguments (supporting “quoted string” as a single argument and some escape sequences like \n). It also supported pipe |, because I already had an idea for that. After those lessons I returned back to my room. First thing to do was to add that prototype to my sketch page and create some nice UI for it. I’ve actually been streaming all that to Twitch (even though noone does watch me), but I wasn’t recording. Then I’ve started adding more pages into the “internet” of mine: some simple ones like Mailbox (totally static) and browseros system pages like settings, admin and no_internet. By the end of the day I’ve also added a Play player, which is using YouTube API, and a temporary playlist to check that it works. My friends helped me on the day two. One of them is really into web-development, but he was quite busy, so his total impact wasn’t as big as I thought it would be. The other one never worked with all that web stuff before, so I asked him to help me with the story and translation. I had some sketches for dialogs, but was working on the other things, so I explained him the story shortly and returned to my work. First of all, I had to start working on backend part of the game, because I knew that I want to hide some parts from the player. So I created a lightweight virtual machine and set up some LAMP stack on it, because that’s what I have on my site hosting (where I was planning to release my game on). That’s where PHP was added in. From now on the game wasn’t just a bunch of static HTML pages, and required some server. From the other hand, now I could add login and use database to store player’s progress. I’ve also made translation on backend: user’s browser sends a cookie to server and depending on its value I’m sending one or another texts in response. I wanted to determine user’s language by IP, but PHP geoip module wasn’t available on my site’s hosting, so I had to remove it later on. Then some other backend systems were added: search, “networks” and URL handling. Even though it’s possible to implement these on frontend, it would also be possible to look in the JS source code and see which IPs, URLs and sites in search index are available, meaning the players could possibly find something I don’t want them to find yet. Search gets user’s query, splits it into separate words and then searches for similar keywords in the “index”. Index contains all sites I wanted to be searchable, its title and descriptions and arrays of keywords. To make search a little bit smarter, I’ve decided to use Levenstain distance to find out whether keywords are similar, but that’s why search sometimes returns some funny results. “Networks” is a special set of objects, which represent a network node. Each node can have an array of hostnames (IPs or actual names) and a set of opened ports with some “services” on it. Using that I could easily add more computers to the network of the game, and add some ssh/web/etc services (only the first two were implemented). URL handling parses the string player enters in the in-game browser field and searches for a match. It’s basically a hardcoded set of strings (like “search.com” redirects to some “/pages/search/index.html”), but it’s also aware of the networks, so if you’d try <IP>:<port> in URL field, it would check if there is such node and if there is a web service on specified port, and if so, show you the associated page. Once I finished those, I started working on IRC, which was the key element of story telling in the game. I’ve decided to go with predetermined options for player to select from and a funny SUPERHOT-like button mashing mechanic for players to type these options. I also wanted new messages to appear one by one, so I’ve getting all new unlocked messages with AJAX and them play them in the order with the delay specified. I wasn’t using database to mark which messages were already read, so if player updates the IRC page, it instantly shows all new messages. The nice thing though is that message notification sound plays even if you’d leave the page. The sound was created with sfxr, btw. By the end of the day I’ve got some dialogs from my friend. He wanted to make the entrance a little bit smoother for the player, so he added some tutorial part where you’re answering some kind of buddy who doesn’t know anything and always asks for help. The idea with different options for that sequence is totally his, and I think it’s quite funny. So, in the beginning of the third day I already had some systems working, but there was no story or tasks for player to do. I already knew what tasks I wanted to add, but these were not implemented at all. For example, to run the exploit, player had to connect to the remote server with ssh, but there was no ssh yet. In order to implement that, I actually had to change a lot in that shell emulator of mine. As this was Monday and had some lectures again, I couldn’t work on something heavy, so I was just implementing dialogs I got from my friend: redacting these a little, thinking of the names for the characters, testing how it shows up in the game. Then I’ve added the first task: to open a web interface, login using given credentials and see the sticker on the monitor. It’s funny how everybody wanted to zoom the picture in and see what’s on sticker when my idea was that if that’s too small, player would go back to IRC to see what changed in there. The second task was a bit harder: it requires a terminal, but as I knew hackers wouldn’t explain player how to open it and how to use it, I had to add some hints. That’s why I’ve added a scriptkiddie blog, where he shows a screenshot of open terminal and a browser URL which you could use to open it. There is also where I’ve put hint on how to use curl and curl | dash (that’s browseros shell). I didn’t add any hint on ssh, though. Then I’ve started some polishing: added playlists (default “player’s” and an electronic “by Tkachov”), added translation everywhere (because the friend of mine couldn’t manage all the PHP I had in the project), drawn icons, renamed some things, etc. After all that I felt a little bit tired, so I decided not to spend the last hours remaining to add content, and just moved the game to the hosting, created an entry and a short post. Even though I knew my game is working fine, I thought it could be too short, not interesting or demanding some knowledge players don’t usually have. So I was surprised to see how well it was received by people who commented my entry. I actually ticked a checkbox to allow anonymous comments hoping that would get me more feedback, but I don’t really remember seeing any anonymous comments on this site, so it’s either broken or nobody wants to be anonymous. What didn’t: not everyone liked button-mashing; there is not enough hints; there was no message to notify user that the game has ended already. I’ve fixed the latter, but everything else remains the same it was when I created an entry. I do want to make more, but I’m not sure when I’d get time to do it. You can also play it in any modern browser without installing any plugins. I’d really appretiate your feedback, so please let me know what you think of it! HourGlass Collector. When simple things are not so “simple”. First of all, I want to thank everyone for the provided feedback. We appreciate that! It was an awesome jam and we had a lot of fun. So I decided to tell you our story. Skorpyo. Team Lead, Programmer, Project Manager. Fourcy. Game Designer, Level Designer, Artist. “One Room”. This theme was unexpected. But it turned to be a very interesting one. It wasn’t a hard one for us. The idea immediately popped up in my head. Our game designer polished it and we started our project. Fourcy started to make game design. First thing he made was a list of game elements. They were used as game objects. With this list I could make a set of placeholders to test mechanics, controls and other stuff. I started coding while Fourcy was working further on game design. Next step – game mechanics. Our game has a lot of different game mechanics. Fourcy came up with around 15 of them. Not all of them made it to the end. Some were changed, rebalanced or trashed. I will not show you the full list cause this will ruin your game experience =) At this point Fourcy started to work on art. All sprites were made by Fourcy. He used Sai as graphics editor. Fourcy spent a lot of time polishing this “level”. It had to contain lots of “game layers”. This was the result of “brainstorming”. This game was made in Unity3D (C#). After recieving list of game elements I started to work. I made a list of placeholders and started to implement base logic. Here we began to move and jump. What a platformer without jumping? Spikes added (yellow box). First real danger. By “danger” I mean DANGER. See these corpses? Working with placeholders saved a lot of time. I’d made almost every game mechanic before we had sprites ready. But with sprites it looks better. Our game is almost ready. We need one more thing – a good soundtrack. This is where our composer starts to shine. Provided with gameplay and pictures he made an OST that changed the game. It was no longer a boring platformer but a funny game that attracts you from the start and keeps you till the end. If you like the OST and want to listen more, search for Xcentric Noizz. We asked everyone we could to try our game. We knew it was hard so we made the game a lot easier. We can’t make it even easier because it will become boring. We did our best to balance the difficulty curve. But there’s always room to improve. And thank you for the feedback and gameplay videos. This helped us to find the problem. 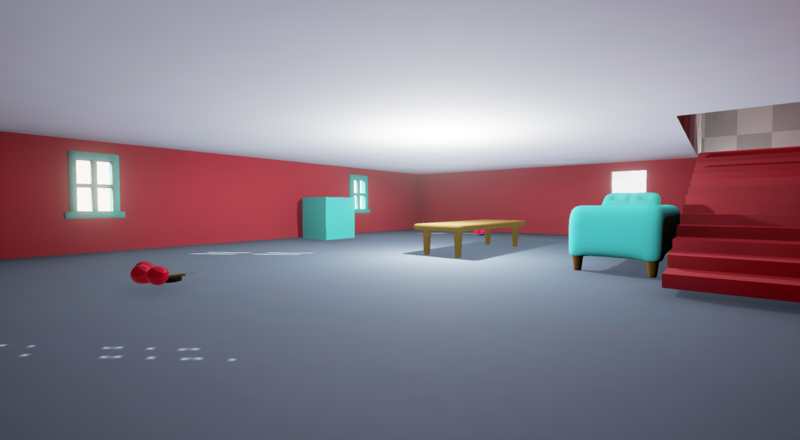 The theme for this past Ludum Dare was “One room”. I decided to make a video game version of the Roomba knife fights videos from YouTube called “Roomba Fight Club”. The premise to the game is very simple. You have a Roomba with a knife strapped to the front and three balloons strapped to the back. The goal of the game is to protect your balloons while popping all of your opponent’s balloons. This task is compounded by the intentionally difficult tank controls and scattered furniture around the room. Development for this idea started really rough. Like incredibly rough. I could not think of an idea for the “One Room” prompt. I lost about 2 hours of development time just pacing back and forth in my room trying to think of a game that would only take place in one room. I had learned last year that you can’t go too outside the box with the theme ideas. I had a couple of commenters let me know that they dinged me points for “Safe or Sorry” because while the meta game was played with only two buttons, the actual game was not. I wanted to avoid that if at all possible and let the player know that I had indeed stayed on theme. My first idea was to do some sort of multi-dimension thing ah la “Rick and Morty”. Something where there were a huge number of identical rooms in parallel universes, but that would require a bunch of ideas for each universe and time to implement them all. This was a no go for a game jam idea. I then came up with a bunch of plays on the word “room” such as “The elephant in the room” or “Wiggle room”, but game mechanics weren’t apparent in either idea. I finally settled on Room-ba based room combat in a living room. Hopefully the theme didn’t get lost on people this time. This year I focused way more on “planning before execution” than i had the previous year. Before I started coding anything I had a basic idea for how the game would play. I had a basic idea of the shape of the room and the aesthetic for the game. I even picked out a color palette to stick with using http://www.colourlovers.com/ before I ever even started coding. This is in stark contrast to last year where I just started coding right out of the gate. I think what changed this year is that I was at least a little familiar with the process. I wasn’t so scared that I would run out of time that I felt that every moment needed to be put toward creating a tangible asset. Once I had my basic plans laid out I still didn’t just jump right into code. First I grey boxed everything. 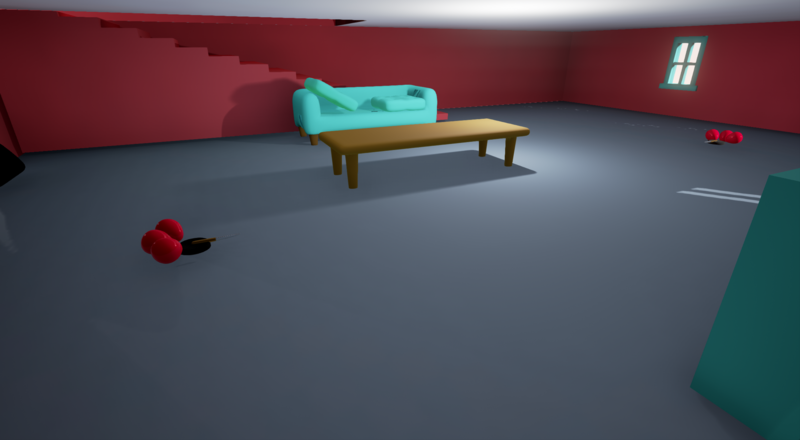 I laid out the basic perimeter of the room and cordoned off the areas where props such as the couch and TV would go. This took a few tries to get right. I didn’t want the room comically large, but I also wanted it big enough to move around in. Once that was done I moved into the pawn setup for the Roombas. I played with making them all physics driven, but that turned into a nightmare quickly. It was too easy to get flipped over or to create really weird physics issues. I eventually just had them inherit from the default Unreal Character class, but in doing so I wound up getting the default capsule collider which caused a few problems of its own. I even had the balloons on strings originally with forces constantly pulling them upwards. It was cool, but it made them impossible to stab with the little knife, and extremely unpredictable. Once I got movement down I built out a really simple AI for your Roomba opponent. It’s a behavior tree with three nodes. Wait a random amount of time. By making some of the parameters random the AI feels a little less predictable, but all in all it took me the least amount of time in this project. 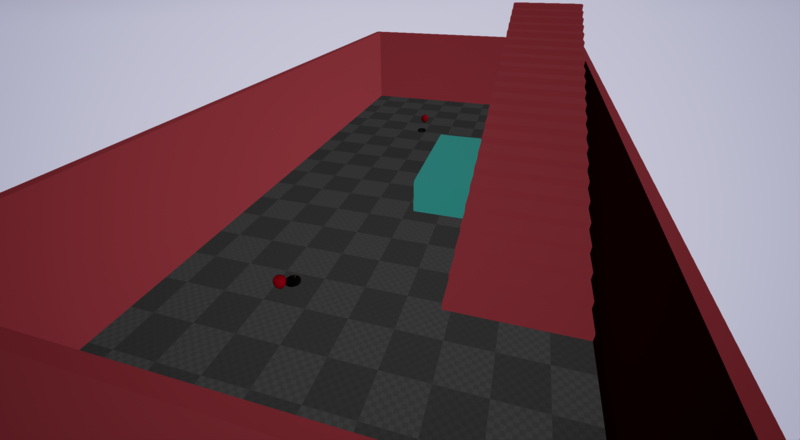 I played around with making the AI smarter, and making it use Unreal’s path-finding, but I found out quickly that the game was way more fun when the AI just smashed its way through the environment like some 90’s kool-aid man. 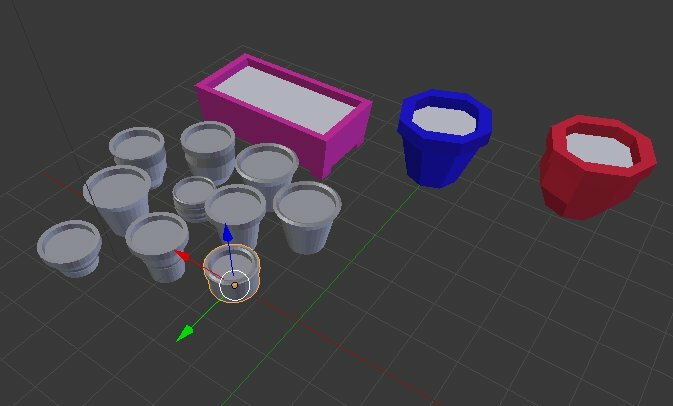 Create BSP volume in Unreal the approximate size of the asset I wanted. Model basic mesh in Zbrush using Zmodeler and dynamic subdivision. Kick back to Blender to clean up, UV and Assigning materials. That was about it. I skipped texturing which saved me a ton of time. Other than the wallpaper which I generated using a tile generator, every material is just a single color. Last year I used Substance designer to create my textures, but the amount of time I lost didn’t seem worth it for the final outcome. The music for Roomba fight club was generated in Bosca Ceoil. The same as it was last year. Sound effects were created by a combination of recording noises on my cell phone and using www.bfxr.net . Boxing out the room first meant that I didn’t have to make zero hour design choices and updates. I played around with everything while it was ugly, so that once it looked nice I could just leave it alone. By deciding I wasn’t going to waste my time this year with textures I freed up a lot of time to send on other aspects of the game. Because I stuck with a pre-determined color palette the game still looked pretty nice even as flat colors. Multiplayer wasn’t one of my original design choices. It got added to the game on the Sunday morning before turning it in. I had to call a buddy to bring over a Gamepad just to test to see if it even worked. This turned out to be an easy win due to how UE4 is set up. I just had to spin up a second player controller and that was about it. Most of the work the engine does right out of the box. Like multiplayer this feature was added late in the game but made a huge improvement. Originally couches were unmovable and the furniture was just something have to work around but I kept getting stuck on it. It was trying to figure out a solution to that problem that lead me to make the whole room alter-able. The effect was easy to implement and it made the game way more fun. I tried adding a little Juice to this project. I added some time dilation and screen shake on balloon pops. I also added a confetti style particle effect. None of that was very hard to implement, but I think it makes it feel better when you score a hit. It turns out I had a lot to learn about lighting. I probably still do. Every other game I’ve worked on has either been outside, so the lighting was pretty much handled by the Sun (directional light) or has been intentionally dark. I found it really difficult to get the indoor light to look natural. I wound up just using a post process that added tons of ambient light, but I doubt that’s the right way to do it. I had intended for the controls to be a little clumsy. I had wanted the controls to be a little clumsy, like an old school tank controls type game. Unfortunately I don’t think I implemented them well. Turning isn’t great, and the camera is locked to the Roomba’s rotation, so turning always feels a little jarring. To make matters worse enemy AI Roomba turns instantly and accurately. It’s hindered b the distance it can travel, but it’s got pin point accuracy making it very frustrating in single player mode. There’s an inspirational quote floating around on the internet that goes something like “It doesn’t get easier, you just get stronger.” I feel like that really applies here. I feel like my entry for this Ludum Dare is heads and tails above what I turned in last time, but I don’t feel like it was any easier to create. If anything I feel like it was harder. There are a lot of systems in play for this game that did not exist in the simple survival horror game I made last time, but I don’t think I would have attempted something this ambitious had I not already done the game for LD34. So to answer the question “did this game jam treat you any differently?”, yes. I feel like this Ludum Dare treated me different. Not better. Just different. To be honest, I wasn’t intending to enter the jam because I’m busy with other things, but when I saw what the theme was Saturday afternoon I knew I had to go for it. 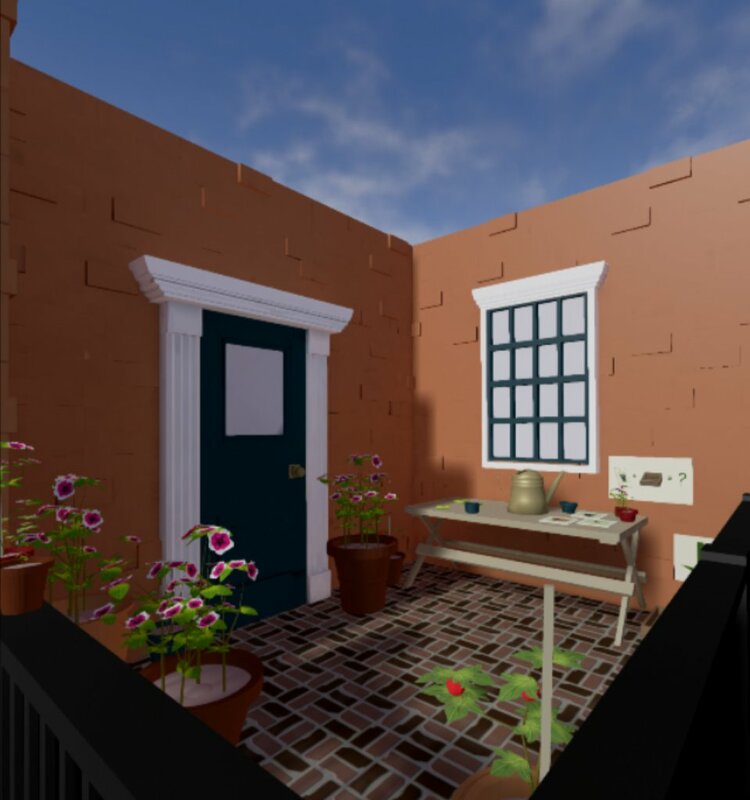 The theme, One Room, fit well with a VR idea I had sitting around in my drafts and I figured it was a good chance to get it started. 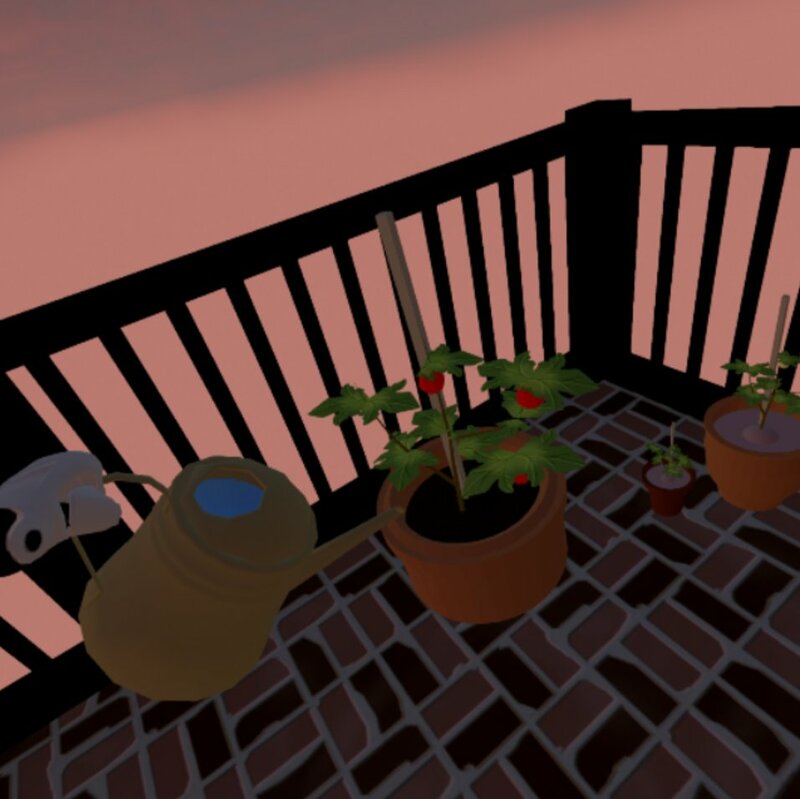 The VR idea was simple: growing plants on your own private balcony. 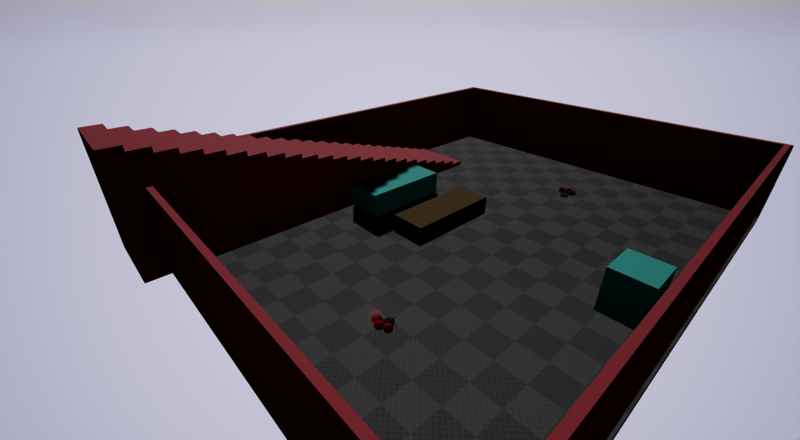 However, I wanted to make use of room scale VR, and have the game take up the minimum amount of space required. I wanted to make a game where everything was practically in reach and you didn’t really need to teleport around. Thus, Botanic Balcony was born! The grey box ft. walls and rails. I am so thankful that UE4 comes with a default VR setup. My biggest issue with getting the game running in VR was simply based around getting UE4’s default VR setup to run, which honestly came down to one thing: packing for distribution properly. Once that was out of the way, it was easy for me to run the default, throw some stuff around and get cracking. In any case, getting the VR part of the game to function was easy-peasy. The growth cycle of tomatoes. It was… an experience…. 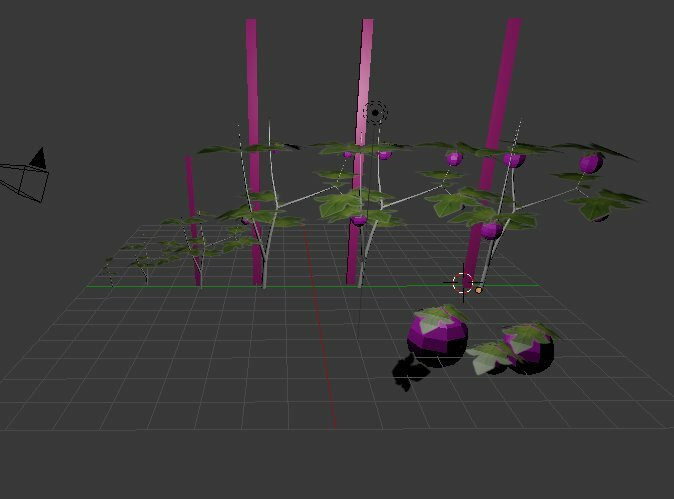 I feel like I wasted so much time modelling things out, and I wish I could’ve included more plants. 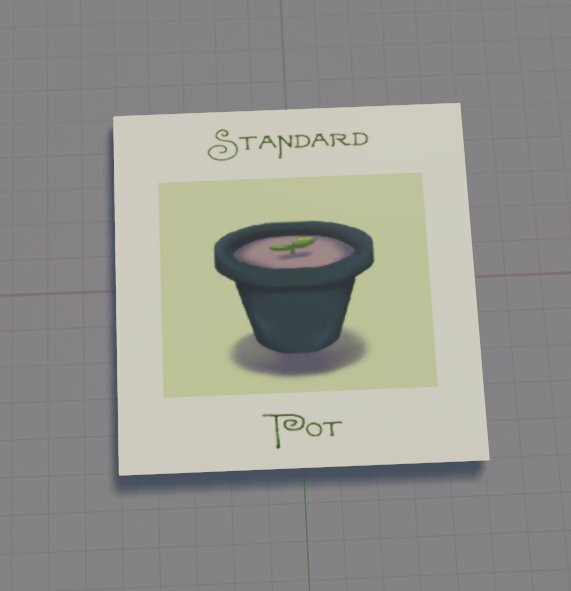 I thank youtube videos and those people who helped me out during my short twitch stream where I tried to model a pot. Otherwise I would’ve been 100% lost. Because of these restrictions though, I aimed for a more low-poly type of thing, and kept most materials to be plain colors. I think it came out pretty well from a design perspective. Definitely the most complicated thing to model was the watering can. 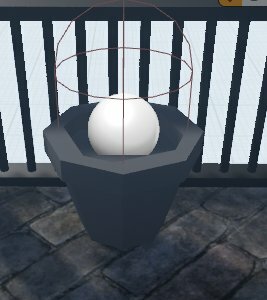 There were a few things that came up during my development which might come in handy to keep in mind in the future if you ever try out VR development. The Vive headset is normally rather blurry for me because the distance between my eyes is less than 60cm, which is the lowest the headset supports. Because I normally feel some sort of nauseous when I play, I didn’t notice that the frame rate was running at 60fps when I first submitted the game. I had tested the game out on my brother, who happens to just not notice the frame rate drop, so I had no idea until my father tried it out. (My family is my guinea pigs.) My father noticed right away and let me know, and it took a while to figure out what was causing the cap. It’s best to check these things first before trying out the wide variety of suggestions online. I tried changing it through command line arguments, turning off lots of settings in the post process volume and so on. In the end, it was rather simple. Spawn a pot using a pot card! I’m a fairly average-sized person (5’6”), so when I was developing the game, everything felt about right for me. However my father and brother are taller (about 5’10”) so things like the fences and walls and so on originally felt rather short. I was lucky enough that most of the models I made I guesstimated the size correctly, but for things like the door I had to look up measurements to make sure it was about right. It was rather interesting though how you could easily go from being about average height to being a mouse, to being a giant just by changing the scale of your items. This may be specific to my setup, but the first 12 hours of the jam I was constantly testing things out and having VR running. The VR machine doesn’t really seem to be able to handle that type of workload. At one point while testing the computer started to overheat a bit and the VR headset lagged considerably. So bad that it felt like I was having the symptoms of fainting. I ended up doing a lot of tests with dragging blocks around in UE4’s editor and flying around, using the VR machine only when absolutely necessary. For now though, give it a look and maybe a play! There’s a youtube playthrough for those without the Vive. Really enjoyed my first jam. I was able to come up with several ideas within couple hours, and settled on one shortly after. Mechanic didn’t take too long, spent significant time on graphics and audio (not that they turned out well). That I can make and publish a game! This is a big one for me, as I have been writing code for a while, but I never really made anything. I used LMMS and sfxr for the first time, and learned a ton about Unity3D. Feedback on my game is also great. I guess this is my final postmortem post for Cure4Life. In this post I want to show you how our game changed from beginning to the end. Quick tip: Using some sort of CVS (Git, for example) is very useful for this kind of posts. It is difficult to find some time and capture game while jam is in progress (and if you’re not making timelapse). After discussing core gameplay I started making prototype without proper sprites. 26 queries executed in 0.161 seconds.